Value $5,400 A great discount offer! Updated to include 10 Powerful Courses! Whether you are a professional martial artist, performer, action actor, stunt man, MMA / UFC fighter, student, Sifu or instructor...The martial arts cannot be done with proper alignment and good form until you have the flexibility to carry out the proper technique. The reason many Kung Fu Kicks are practiced kicking high is to develop the flexibility, strength, precision, speed and control to be able to put your legs anywhere. These programs will also help clear pain, speed up healing process and decrease chance of future injuries. Some of the programs finish a balancing meditation and help you program to align with your highest visions of yourself. The Stacey Posture Strap & Stacey Stretch Strap are highly recommended for stretching, kicking to create masterful muscle memory including balance and stability. 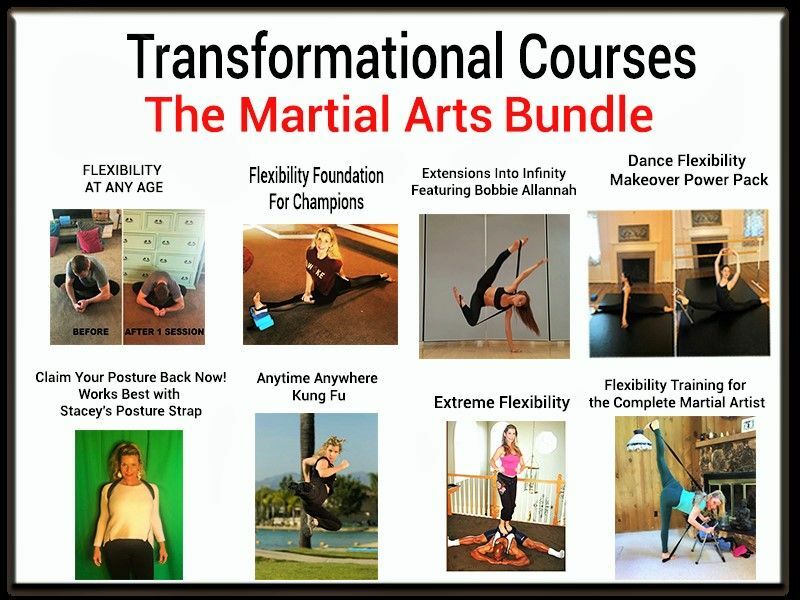 After you have trained with the flexibility makeover programs your mind and body will be prepared to increase range of motion in "Flexibility Training for the Complete Martial Artist"